Bring a pot of water to boil and begin to cook egg noodles according to package directions. In a large skillet over medium high heat, brown ground beef until thoroughly cooked. I like to leave chunks of ground beef and not break it up too small. Drain ground beef to remove excess grease from pan. Put pan back on stove (setting aside the ground beef), add 2-3 tbsp butter and also the chopped onions and mushrooms (if using). Sauté the onions and mushrooms, over medium heat, until onions are soft and then add garlic. Only cook for another 1-2 minutes so garlic doesn't burn. Add flour to pan, stir and let it absorb butter. Now add beef broth and whisk vigorously to remove any lumps, turning the heat up to high, bringing it to a boil for 2-3 minutes until you see it thicken slightly. Bring temperature down to medium and whisk in sour cream and cream of mushroom soup. Stir until mixture is thoroughly incorporated. Add salt & pepper. Keep tasting mixture until it is seasoned the way you like. I probably use a good teaspoon and half or more of salt and pepper (and sometimes a bit of garlic powder, for good measure). If it gets too thick on you, just add a tad more beef broth. Add ground beef back to mixture until reheated. Serve over hot egg noodles. 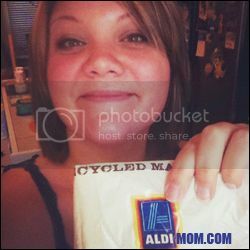 To contribute a recipe, email your Aldi recipes to TheAldiMom@yahoo.com or via our Facebook group!